Motorola Mobility is in for two rough rides next month at the upcoming FRAND contract trials in Seattle, Washington (Microsoft) and Madison, Wisconsin (Apple). Two days ago I reported on Judge Barbara Crabb's note to the wholly-owned Google subsidiary that it may have to cope with overlaps between the two trials. In mid-August, Apple had scored a partial victory at the summary judgment stage. And late on Monday, Judge Crabb ruled on the parties' motions in limine (motions to exclude testimony or argument). On balance, those decisions favor Apple, but the judge sided with Motorola on a few questions, including a legal issue relating to the history of negotiations between the parties that Apple will have to overcome in order to receive a court-ordered FRAND license to Motorola's standard-essential patents (SEPs). Apple is on the winning track but it still has some work to do. In the Washington/Microsoft case, Judge James Robart has also adjudged the motions in limine, but at this stage all that is known is that he granted some and denied some at the pretrial conference held yesterday. I will report on that case again as soon as further information becomes available. Motorola fiercely opposed in both cases -- the Microsoft case and the Apple case -- the idea that the courts might set the terms of a FRAND license and take whatever measures necessary to ensure that such a license be put in place. Judge Robart in Seattle clarified on October 10 that his intent is to bring about a definitive solution, i.e., a license deal rather than additional SEP litigation. And Judge Crabb in Wisconsin reserves the same right. She denied Motorola's motion to preclude Apple from "seeking specific performance". In my comments on the headlines of the parties' sealed motions in limine I had already said that the most likely explanation was that Motorola wanted to prevent Apple from gettin a court-ordered license deal. Based on Judge Crabb's order, it turns out that this is indeed what "specific performance" meant here. I conclude that specific performance may be an appropriate remedy under the circumstances of this case. In fact, it may be the only appropriate remedy. As I held previously, Motorola's declarations to ETSI and IEEE constitute binding agreements to license its essential patents on fair, reasonable and nondiscriminatory terms, and Apple is a third party beneficiary to those agreements. Dkt. #194 at 42. As a third party beneficiary, Apple is entitled to a license of Motorola's patents on fair, reasonable and nondiscriminatory terms. Unless and until Motorola gives Apple a fair license to its declared-essential patents, Apple will continue to face the threat of patent infringement litigation from Motorola. It would be highly inefficient to require Apple to bring a new lawsuit for monetary damages or declaratory relief each time Motorola sues it for patent infringement. Additionally, it makes little sense to order the parties to continue negotiating a license when they have been unable to reach an agreement through five years of negotiations. The degree of clarity that this paragraph provides and the focus on solutions that it reflects are representative of the entire 57-page order. Other federal judges handling smartphone-related cases have received much more attention so far because there's more public excitement about infringement cases than FRAND contract cases and because there's simply more press in California or Chicago than in Wisconsin, but I'm extremely impressed with Judge Crabb's no-nonsense style. The way she decides and writes is unfussy and to the point. And very importantly, she doesn't try to navigate around thorny issues: she deals with them. In its Wisconsin FRAND case Apple benefits greatly from Microsoft's pioneering efforts to enforce a FRAND promise and from the FRAND part of Judge Posner's ruling, which addressed some of the issues that Motorola was trying to relitigate in Wisconsin. But Judge Crabb told Motorola that its ongoing appeal of Judge Posner's ruling does not change the fact that certain issues have been adjudicated by a district court. For example, Judge Posner threw out some Motorola SEPs because they were not valid or not infringed, and while this won't be taken into consideration with a view to the reasonableness of Motorola's original 2.25% royalty demand, it will be a relevant factor when determining the appropriate FRAND royalty rate based on what's known today. Also, Judge Crabb has concluded that Judge Posner has already adjudicated the question of whether Apple needed to make a counterproposal to Motorola before suing for breach of a FRAND pledge: it didn't have any such obligation. "Additionally, this provision suggests that Apple may have been required to engage in licensing negotiations related to its own patents. In other words, evidence that Apple refused to provide a license to its own patents or refused to engage in negotiations related to its own patents would be relevant to whether Motorola breached its contract with ETSI. Neither party has provided evidence or argument on this issue, so I cannot determine the significance of this provision at this stage. The parties should be prepared to address this issue at trial." I don't think this is a loophole that will ultimately enable Motorola to bring and pursue abusive SEP assertions. And since I wasn't present at any Apple-Motorola meetings, I have no idea what Apple said about the grant-back option. Even if Apple can't prove that it addressed the grant-back issue satisfactorily, the court may nevertheless find that, on the bottom line, Motorola breached its contract through an unreasonable demand. Also, it's well-documented (and restated in yesterday's order) that the parties started talking in 2007, at a time when Apple may not have owned even one patent essential to an ETSI standard. It does own a number of them by now as it stated in a letter to Samsung in April 2012, but back in 2007 its ETSI SEP holdings may have amounted to zero, in which case the whole grant-back question is a non-issue. Apple has some homework to do. Otherwise there's a risk of further delay before it finally obtains a FRAND license to Motorola's SEPs, despite the judge's belief that such a license "may be the only appropriate remedy". But if Apple comes up with some good points in this regard, it may soon be licensed on a worldwide basis to Motorola's SEPs (except that Google will presumably appeal such a decision). I'm now going to quote the summary at the end of the order. Among the items I did not discuss above, one that's particularly worth paying attention to is the first one: while Judge Posner held that Motorola was not entitled to injunctive relief over FRAND-pledged SEPs, Judge Crabb found that this is not, all by itself, tantamount to a finding of a breach of contract. And with respect to item 18 I'd like to mention that Judge Crabb doesn't believe Apple can raise a patent exhaustion-related argument at this stage, and she says that "Apple's breach of contract theories premised on the Chi Mei and Qualcomm licenses [which Motorola terminated with respect to Apple as a third-party beneficiary] may be flawed". 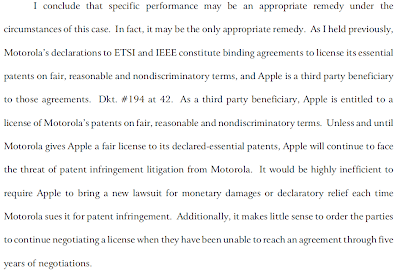 So I would count item 18 in Motorola's column even though Apple will be allowed to use Motorola's license agreements with those third parties as evidence for the unreasonableness of the 2.25% royalty demand. 1. Plaintiff Apple Inc.'s motion to preclude Defendant Motorola Mobility, Inc. from offering evidence or argument that it was entitled to seek injunctive relief or that it did not breach its contracts with ETSI and IEEE by doing so, dkt. #310, is DENIED. 2. 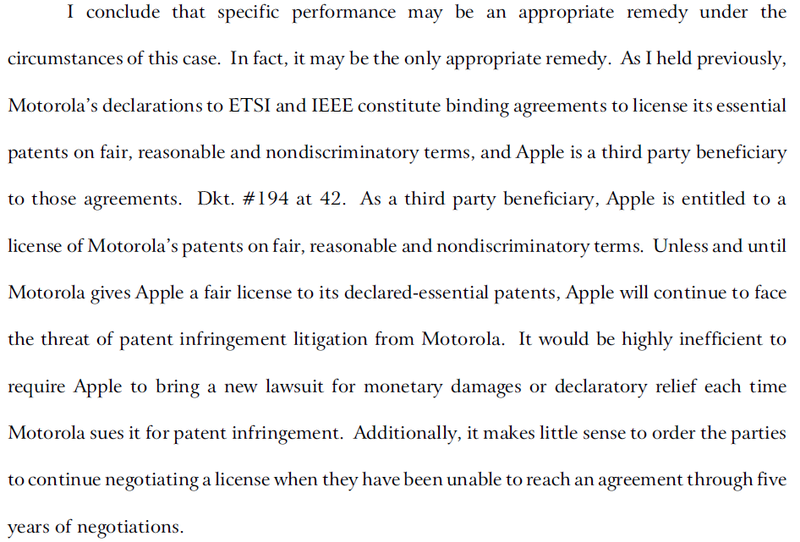 Apple's motion to exclude evidence and argument that Motorola's patents ruled invalid or not infringed have value, dkt. #311, is GRANTED IN PART and DENIED IN PART. Prior decisions regarding validity and infringement of Motorola's declared-essential patents are relevant to the current fair, reasonable and nondiscriminatory rate for Motorola's standards-essential patent portfolio, but are not relevant to Motorol’s license offers made before the decisions were issued, as explained in this opinion. 3. Apple's motion to exclude evidence and argument that Apple must satisfy a condition precedent to trigger Motorola's licensing obligation, dkt. #312, is GRANTED. 4. Apple's motion to preclude Motorola from offering evidence or argument that it had a 'process' for complying with standards-setting organizations' disclosure policies, dkt. #313, is GRANTED IN PART and DENIED IN PART. Motorola cannot introduce any evidence at trial regarding its process for disclosing intellectual property rights unless it made that information available to Apple during discovery. 5. Apple's motion to preclude Motorola from offering evidence about why it purported to suspend its license with Chi Mei, dkt. #314, is GRANTED IN PART and DENIED IN PART. Motorola may present any evidence on this issue at trial that it provided to Apple during discovery. 6. Apple's motion to preclude Motorola from arguing that its cellular standards-essential patent rights were not exhausted as to the first iPhone, dkt. #315, is DENIED. 7. Apple's motion to preclude evidence and argument regarding opinions on alternatives from Motorola's technical experts, dkt. #316, is DENIED. 8. Apple's motion to exclude certain Motorola expert testimony, dkt. #317, is DENIED. 9. Apple's motion to exclude Dr. Leonard from opining on the correct royalty rate for Motorola's declared standards-essential patents, dkt. #318, is GRANTED IN PART and DENIED IN PART. Dr. Leonard may not testify about a particular rate or range that qualifies as a fair, reasonable and nondiscriminatory rate for Motorola’s standards-essential patents, but may offer opinions about whether Motorola's 2.25% offer was a breach of Motorola's contracts with ETSI and IEEE. Additionally, Dr. Leonard may offer criticisms of the methods used by Apple’s experts to calculate a particular rate. 10. Apple's motion to exclude testimony of Dr. Leonard relating to synergies, dkt. #319, is DENIED. 11. Apple’s motion to take judicial notice of Exhibits 1-45, dkt. ##322, 323, to the Sept. 28, 2012 Declaration of Richard Anthony Lopez, dkt. #321, is GRANTED. 12. Apple's motion for leave to rely on supplemental expert reports, dkt. #226, is DENIED. 13. Motorola's motion to preclude Apple from seeking specific performance, dkt. #280, is DENIED. 14. Motorola's motion to preclude evidence and argument relating to timeliness of patent disclosures to ETSI, dkt. #283, is DENIED. 15. Motorola's motion to determine the terms of ETSI and IEEE policies, dkt. #286, is DENIED. 16. Motorola's motion to preclude evidence and argument arising after January 4, 2011, dkt. #289, is GRANTED IN PART and DENIED IN PART. Both parties are constrained by the explicit prohibitions of their non-disclosure agreements, but may introduce evidence arising after January 4, 2011 that is not expressly prohibited by those agreements. 17. Motorola's motion to exclude evidence and argument concerning prior litigation judicial decisions regarding the patents-in-suit, dkt. #292, is DENIED. 18. Motorola's motion to exclude evidence and argument relating to non-parties Chi Mei Communications Systems and Qualcomm, dkt. #295, is DENIED. 19. Motorola's motion to exclude evidence and references to irrelevant standards and standards-setting bodies, dkt. #298, is GRANTED IN PART AND DENIED IN PART. Apple is precluded from introducing testimony and evidence regarding standards that are not at issue in this case and standards-setting bodies other than ETSI and IEEE, and ETSI and IEEE standards that are not at issue in this case, unless Motorola opens the door to such evidence and argument. 20. Motorola's motion to preclude the testimony and opinions of Dr. Louis Berneman, dkt. #301, is DENIED. 21. Motorola's motion to preclude the testimony and opinions of Dr. Dennis Carlton, dkt. #304, is DENIED. p>22. Motorola's motion to exclude evidence or argument related to allegedly 'noninfringing alternatives' to Motorola patents, dkt. #307, is DENIED. 23. Motorola's motion to strike the supplemental expert report of Dr. Cimini, dkt. #218, is GRANTED. 24. Motorola's motion to strike the supplemental expert report of Dr. Brian Napper, dkt. #229, is GRANTED.